Explanation: Where's the pulsar? Previously, the nebula CTA 1 showed an expanding supernova remnant, a jet, and a point source expected to be a pulsar -- a rotating neutron star producing pulses at radio energies. But no radio pulses were detected. Now NASA's recently deployed Fermi Space Telescope has solved the mystery with some of its initial observations indicating that the point source is pulsing at gamma-ray energies. The strange source is the first of a class that might be dubbed "dark pulsars", rotating neutron stars that appear to pulse only in high-energy radiations. Such pulsars might not be detectable in radio or visible light if they emit those radiations into a narrow beam not seen from Earth. If true, our Galaxy might have more pulsars left for Fermi to discover. 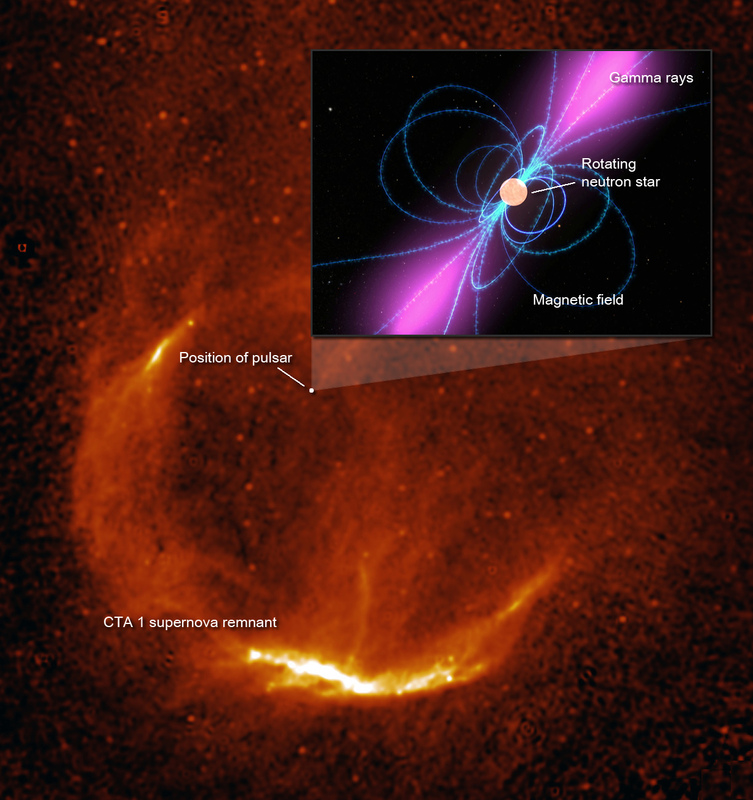 Studying the gamma-ray properties of pulsars gives valuable clues to physics of the emission regions on neutron stars. In this graphic, the pulsar's position is indicated in the wider CTA 1 supernova remnant. An artist's illustration of the pulsar beaming at gamma-ray energies is shown in the inset.